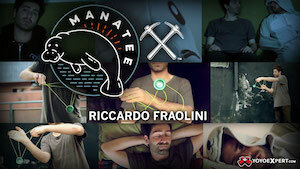 YoYoFactory‘s 2013 catalog folds out into a giant poster of Paul Han. OMG HE’S SO DREAMY! 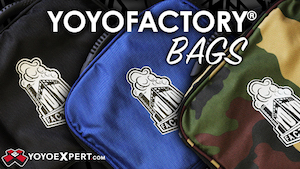 Check out YoYoFactory’s new models and packaging at the International Toy Fair in NYC, Booth #4845, Feb. 10 – 13. The show is only open to the trade, but we’ll have photos of their new releases as soon as the show opens! 2013 North Japan Yo-yo Contest Results! New names and old names faced each other in Northern Japan earlier today at the 2013 North Japan Yo-yo Contest in Sapporo. In 1A, plenty of new names made the top of the list, with Hirotaka Akiba taking the top spot. In 2A, former World Champion Takuma Yamamoto was the clear winner. Taichiro Higashi had no problems taking first place in 3A, while the 4A and 5A titles went to Atsushi Takeuchi and Yoshihiro Abe, respectively. North Japan is usually the smaller of the Japanese regional contests, but that doesn’t mean it’s a weaker contest. With names like Takuma Yamamoto, Taichiro Higashi, and Sojun Miyamura, contestants will have a hard time in all divisions. NJ will take place on January 26th, in Sapporo! Last year Hiroyuki Suzuki started an exceptionally victorious year winning the Central Japan regional contest. Can 2013 be as good? We’re about to find out, as CJ approaches once again. In addition to Mickey, a number of other World Champions are also set to compete, including Shinya Kido in 1A, Shu Takada and Yasushi Furukawa in 2A, Minato Furuta in 3A, and Rei Iwakura in 4A. Central Japan will take place on February 2nd in Iwakura. Check the full list of competitors below! YoYoMafia Battle 2013 Will Rock the Philippines in February! There’s no tighter yo-yo competition scene than in the Philippines. Every contest held in the country always brings the best Filipino contestants and dozens of other players. And the next such contest is the YoYoMafia Battle, to be held at Sm City Marikina, just outside Manila, on February 16th! International attendance is also expected, with Werrd’s trick machine Hassan Marialis already confirmed! Be sure to head to the official event page for additional information! Tatsuya Fujisaka Wins East Japan-A! The East Japan A-Block regional contest was held earlier today in Tokyo, and 2011 Japan National Champion Tatsuya Fujisaka came out on top in 1A! The biggest World Champion of all time, Shinji Saito, ended up in second place, followed closely by Yusuke Ootsuka. Check the results below, courtesy of yoyonews.jp! 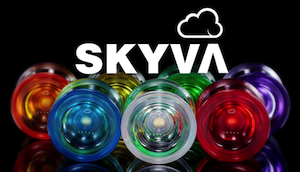 The 2013 Japan Yo-yo League is ready to blast off! 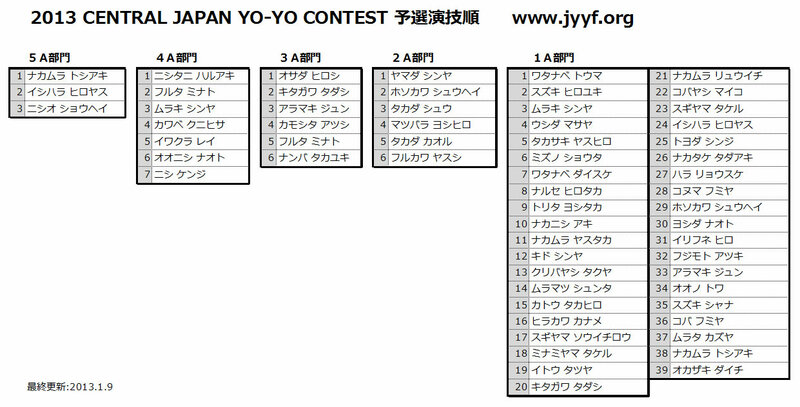 The Japan Yo-yo Federation has announced the dates for the 2013 Japan Yo-yo League! The league will follow last year’s format, with all regional contests taking place early in the year and culminating with the National Contest in June. Last year Hiroyuki Suzuki started an unbelievable year winning Central Japan, then proceeding to dominate Japan Nationals, Asia Pacific, Worlds, and the Bali International Yo-yo Open. Can he repeat that winning streak? We’ll know very soon!